What can Dominique Chionchio in 2003 teach us about us about fandom in 2014 with Star Wars: Episode VII? What can Dominique Chionchio in 2003 teach us about fandom in 2014 with Star Wars: Episode VII? By Derek Case. In the production of any film as big as, say, Star Wars: Episode VII, a common tactic to whet the appetites of the fanbase is to give them a few morsels of production details, without really giving them any useful information about the film itself. I call these particular production details, “peripheries,” that is: set pieces (or components of them), lighting, costuming, and, cast extras. These “peripheries” tend to become king to Star Wars fans when information is otherwise scarce. Sometimes we give them too much importance; sometimes we fall head-over-heels for them. Well, at least I did… once. In this tale, I revisit a somewhat embarrassing chapter in my Star Wars fandom; a tale which I am sure is not unique in the history of general fandom. While the production of Episode VII is underway as I write these words, I am compelled to recount the full tale due to its potential relevance today. And also so I can make fun of myself. In 2003, starwars.com, implemented the Hyperspace subscription membership (now defunct) which allowed members to obtain exclusive first looks into the production of the final prequel film, which was then titled, simply Episode III. I was one of those early subscribers. One particular Hyperspace series, called “On Set Diaries,” included personal accounts written by Pablo Hildago direct from the production floor. 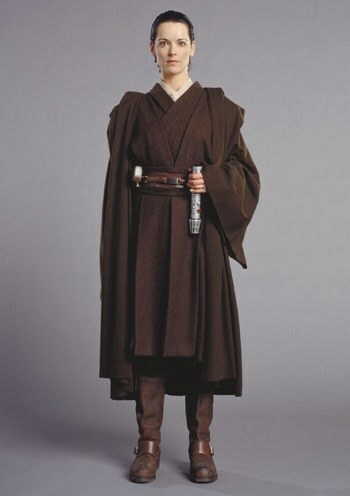 In his diary entry titled “Jedi Trials” (which, according to Wookiepedia was published in August 2003), Pablo wrote of several extras going through costume tests (the “peripheries” of this story). The information in the entry was unremarkable (obviously — since I can’t remember it), but embedded within the body of the text was a small 300×300 (or so) picture featuring one of the extras trying on Jedi attire. Her name, according to the entry, was Dominique Chionchio. To this day, I can still picture the embedded image vividly in my head, however, numerous google image searches have been utterly fruitless in finding the picture in question. For now, I can only describe what I saw: Dominique was a tall brunette with short-cropped hair, sporting a dark brown robe and big brown boots. Judging by her pose in the picture, she seemed very playful. Despite not seeing any video, interview, or anything else that might have given me an idea of what kind of person she was, I went twitterpated over a single, small picture of her embedded in a set diary. Are you shaking your head yet? The Descent A quick internet search in 2003 yielded very little information about Dominique Chionchio. She only had one other movie credited to her name and most of her career appeared to be modelling jobs here and there. Regardless, for the next several months, I waited and hoped for more news from the official site of this mysterious Jedi extra. Maybe she was going to be filmed in multiple scenes? Maybe she was going to have a brief dialogue exchange with Yoda? OR MAYBE she was going to be in a big on-screen lightsaber fight! YES! Dominique was more than just a mere extra to me; she represented the exciting unknown — thanks to my now-creepy fascination with her. In solidarity, I changed my message board avatar to a small capture of her face from the set diary. I even included her name in my profile’s signature. Between 2003 and 2005 I held the torch for Dominique Chionchio, refusing to let her be forgotten in the hysteria known as Star Wars message board discussions. I think, in a way, a part of me wanted the whole thing to become some kind of internet gag, in the same way we gave so much attention to Rick McCallum’s daughter (the infamous “script girl” or Bicycle Man even). You Can’t Always Get What You Want Despite my periodic internet queries into her name through the end of principal photography, no more news came of Dominique Chionchio’s involvement in the Star Wars production. So, I waited. In May 2005, Episode III ( now titled “Revenge of the Sith”) was released to the masses and I excitedly attended the premiere, having mild hopes of spotting the short-haired female Jedi in the film. To my disappointment, however, I failed to spot her or anything resembling her. Subsequent viewings were met with the same result. A part of me was saddened by this fact, but those feelings were vastly overshadowed by the enjoyment I experienced from the overall film. 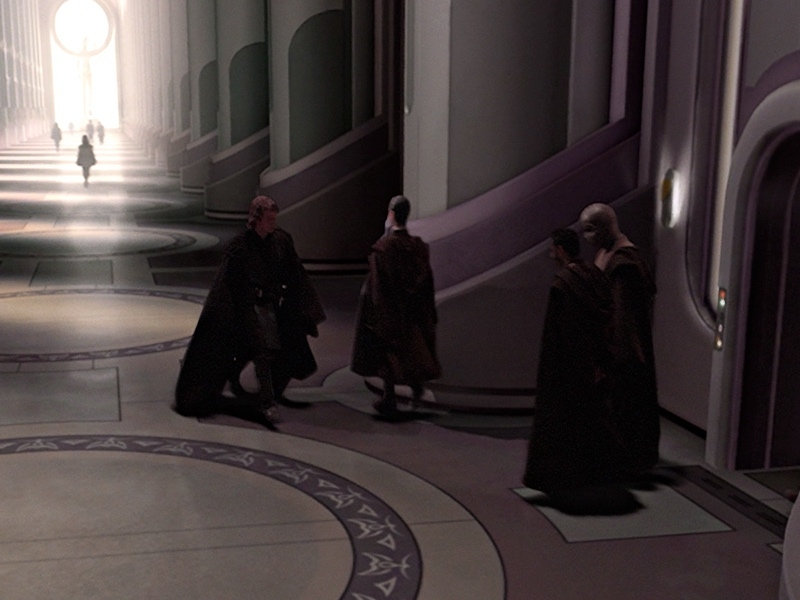 As my attention focused on the bigger issues revealed in Revenge of the Sith, the flame of Dominique Chionchio finally faded in my heart and I… moved on. I look back on the dedication I bore her a tinge of pride, a tinge of humor, but also a tinge of “Yuck! What the heck were you thinking, you creepy weirdo? You might as well build a shrine to her and then marry that.” Yes, it was a very immature time for me. On a more relevant note pertaining to Episode VII: right now, information regarding the newest installment in the Star Wars franchise is starting to trickle onto the internet. So, remember –the stuff we read and see may be tantalizing, but may never be realized in the final cut of the film. Feel free to amuse your geeky-side in the interim, but just don’t get too attached to them. Like, creepily attached. If you do, then you WILL be disappointed. Also you should get out more. Yes! At last! There she is! Okay, so it’s her backside and you can still barely make out her features — but there she is regardless! It was all worth it! Dominique Chionchio, you are in my very soul FOREVER! What? Oh. Sorry, I got a little out of hand there. Let’s just end with a nice takeaway. To the extras of Episode VII, I’ll say this: you’re already bigger than you know, no matter how small your bit part is. And to all the fans, I say: manage your expectations (as well as your creepy tendencies).